Happy Monday everyone! Well…school starts back up today so it’s another 8 weeks of classes. At least for the summer I only have 2 classes instead of my usual 8! WOO HOO!!! I’m happy about that! Since it is Monday, it’s time for another Technostamper Monday Lunchtime Sketch Challenge. It is such a wonderful sketch this week and I just couldn’t wait to use my new set Sea Street. I thought the new dsp and the new set worked just perfectly with it! Coastal Cabana – 4 1/4 x 11 folded, run through the Stylish Stripes folder. 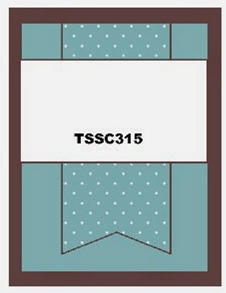 Maritime dsp – cut out the largest banner framelit from the anchor print, add to card front. Whisper White – 1 3/4 x 4 1/4. Stamp the banner flag using Real Red, Coastal Cabana, Night of Navy. Stamp fishes using Coastal Cabana and greeting using Real Red. Add to card front. 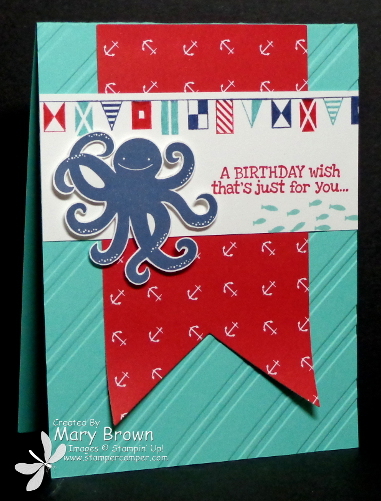 Stamp Octopus using Night of Navy, cut out and add to card front using dimensional. I just simple sketches because you can go so many different ways with it! How fun! Don’t forget to check out the other members of the team and remember go to the Technostamper blog to play along! This entry was posted in Technostamper Challenge and tagged Remembering You Birthday, Sea Street. Bookmark the permalink. Super cute nautical feel Mary, you don’t need to post this but your link to the techno blog is for Jan. oops! Ok, this is my favorite Sea Street card!!! It’s just happy, happy! I thought of you as soon as I seen this set– knew you would rock it! This is such a fun card. I love it. The flags look great like that I would have never thought of that–how do you do all that you do?! Thanks so much for being on the TSSC team. How exactly do you cut out that Octopus?? ?